If you're looking for all day comfort in a sandal then look no further than the Drew Sahara. 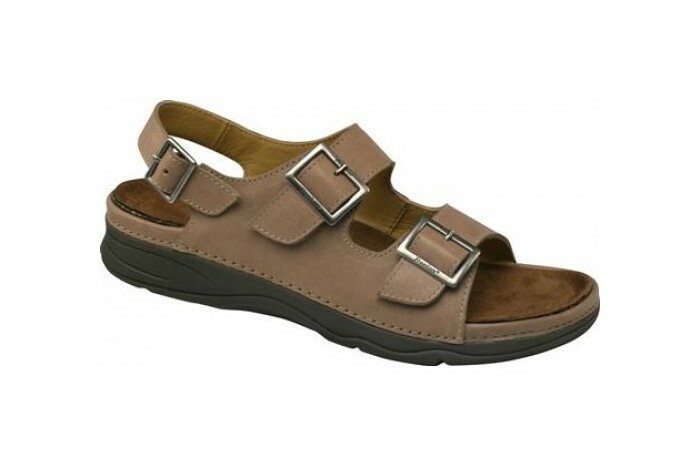 This women's sandal offers the benefits of Drew Shoe's therapeutic footwear including thick, removable, soft cork footbeds with memory foam that accommodate prescribed orthotics. Two hidden Velcro brand adjustable straps and stretch gore back buckle provide a customized fit in a sandal that is as stylish as it is comfortable. Click to see all the Drew Sahara colors. Very pleased with my Drew Sahara sandals. I have over pronation and a narrow foot. Hard to get a sandal. Had to return for longer size. I received them promptly. These sandals are fantastic...no pain from plantar fascists, or tendonitis. Love them. SAHARA SANDALS They fit well. Drew Sahara Sandal Very well made shoe. Fits true to size. Allows you to wear your own orthotics. I am very happy with this purpose. I had been looking for a comfortable sandal that i could use with my custom orthotics. I was not even sure there was such an item. I have been wearing them a few weeks and they are very comfortable. Price much better than a pair I saw on another website.